Waves of panic swept through India's eastern coast on Wednesday afternoon as cities were rocked by tremors and repeated alerts of a possible tsunami being triggered by a massive earthquake of 8.6 magnitude off the Indonesian coast. The alert generated memories of the devastating tsunami of 2004 in which 2.4 lakh people had died worldwide. In India, more than 15,500 had died and scores of coastal villages and fishing hamlets were swept away in the tsunami. As the tsunami warning was sounded on Wednesday, soon after 2pm, the dreadful apprehension of a repeat catastrophe set in deep. 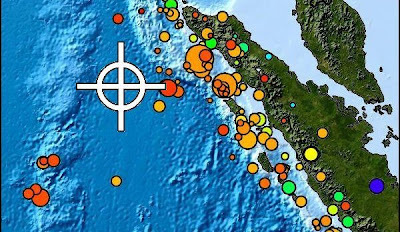 The anxiety lifted only around 3pm when the tsunami didn't hit Greater Nicobar where massive waves were supposed to reach within half an hour of the quake at 2.08pm. Word came in that this quake was different - this time the plates had not moved vertically but horizontally, and this prevented displacement of huge volumes of sea water. By evening, there was a distinct sense of relief. Beaches in Chennai, Puri and other cities along the coast were cleared as the armed forces went on a 'State 1' alert and warships in the region were put on 'hot stand-by' after a massive earthquake of 8.6 magnitude was reported off Indonesian coast. The Air Force ordered two C-130 and one IL-76 airborne with rescue personnel bound for Port Blair on the Andamans, which was the first casualty of the 2004 tsunami that also washed away hundreds of villages along the Tamil Nadu coast. Security measures at several vital nuclear installations, including Kalpakkam and Kudankulam, were beefed up. Schools near the shoreline were shut immediately and parents rushed to fetch their kids as warnings flashed on radio and TV. Chennai port was ordered shut and containers, vessels and tankers towed away for safe mooring. In Kolkata, the underground Metro service was suspended for nearly an hour as high-rise buildings were vacated in central Kolkata and Salt Lake City. Shoppers swarmed out of malls and audiences out of cinema halls and multiplexes, triggering massive traffic snarls in downtown Kolkata. As people rushed out onto the streets after two rounds of tremors cascading from the Aceh quake, the National Disaster Management Authority flashed a tsunami warning, setting off the biggest disaster drill in the country since the NDMA was created. The threat subsided as no wall of water was seen rushing westward from Sumatra but the morning tested every aspect of the disaster drill and rescue response times. Cops and medical personnel were out on the streets and phones jangled across the coastline with warnings as the Union home ministry asked secretaries of the Andaman and Nicobar islands and all east coast states to join any possible rescue effort. The government also readied six battalions of the National Disaster Response Force for deployment from New Delhi in case of an emergency and positioned six more teams in Chennai and 15 in Guntoor. Union home secretary R K Singh, who reviewed the situation in the aftermath of the Aceh quake, said the panic, that lasted more than four hours, had died down along India's coastline and the government was ready to deal with any eventuality. In the Andamans and Nicobar archipelago, sirens blared and rescuers rushed to the inhabited shores to evacuate people to higher ground in six of the most vulnerable islands which recorded more than 3,400 casualties in the last tsunami. Along the Andhra coast, people ran out of offices and homes in Srikakulam, Tekkali, Vizianagaram, Visakhapatnam, Vijayawada, Ongole, Nellore and Tirupati. As in Kolkata, some houses and apartments developed cracks and the tremors smashed glass panes at a few places in East Godavari and Srikakulam.